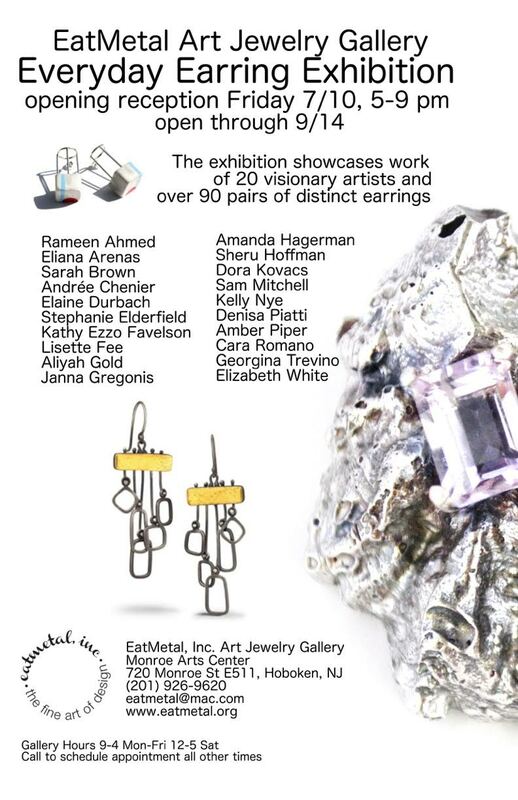 July 10, 2015 opens the Everyday Earring Exhibition curated by Elizabeth Tokoly, owner of Art Jewelry Gallery EatMetal, Inc. located in Hoboken, NJ. The exhibition showcases works of 20 visionary artists and over 90 pairs of distinct earrings. The exhibition is intended to discuss the idea of “Everyday” through the body adornment of an earring. The show will discuss the artist idea of what “Everyday” conveys and allows the audience to engage by viewing, interpreting, and finding their everyday earring. It is the first curated show of the gallery and I am very excited to share each artists’ ideas with the community. Please join me on this evening in welcoming these gifted, accomplished artists. Show runs from July 10th thru September 14th. A must see.